﻿ Rocha Hotel Apartamento, Portimao | FROM $63 - SAVE ON AGODA! "We loved our stay very much it was conveniently located at e..."
Have a question for Rocha Hotel Apartamento? 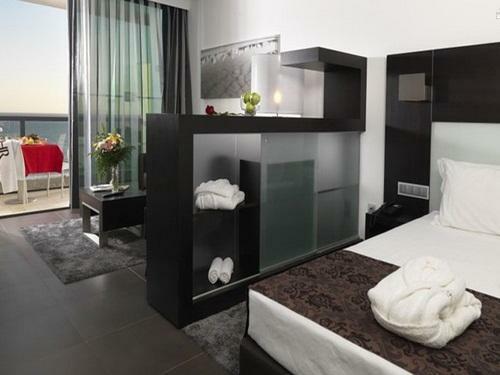 Conveniently located in Portimao, Rocha Hotel Apartamento is a great base from which to explore this vibrant city. The hotel is not too far from the city center: just 3.0 Km away, and it normally takes about 40 minutes to reach the airport. A well-kempt environment and its proximity to Rocha Surf Shop, Museu de Portimao, A Tentacao - Produtos Gourmet give to this hotel a special charm. At Rocha Hotel Apartamento, every effort is made to make guests feel comfortable. To do so, the hotel provides the best in services and amenities. Top features of the hotel include free Wi-Fi in all rooms, facilities for disabled guests, Wi-Fi in public areas, car park, room service. 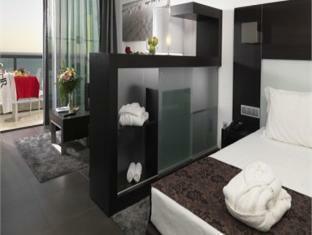 The ambiance of Rocha Hotel Apartamento is reflected in every guestroom. television LCD/plasma screen, separate living room, internet access – wireless, non smoking rooms, air conditioning are just some of the facilities that can be found throughout the property. The hotel offers many unique recreational opportunities such as fitness center, golf course (within 3 km), outdoor pool, massage. Whatever your reason for visiting Portimao, the Rocha Hotel Apartamento is the perfect venue for an exhilarating and exciting break away. "Good location big room near to the beach, good food"
Please note that Half Board option is available at the property which offers dinner at Jupiter restaurant (20 meters away from the hotel). We loved our stay very much it was conveniently located at entrance of the beach with many shops and restaurants. We absolutely couldn't have had better service. Only downfall is the outdoor pool doesn't have sun all day. Ideal location in quieter part of town but easy to walk to bars and restaurants. Large suite with all facilities. Comfortable bed. Not easy to find but worth the struggle! Staff very efficient and friendly. A lovely overnight stay while travelling through Portugal. our room was absolutely huge, so nice and spacious, the bed was super comfortable and also really big! it all looked great. The mini bar was nicely priced and staff very friendly. definately recommend this hotel! l'hotel est magnifique. le personnel compétant et à votre service 24 h/ 24 h. enfin, après 1 semaine d'hotel en hotel une hotesse d'accueil qui parlait français et très bien. encore merci à venda pour son professionnalisme et son accueil chaleureux. chambre immense lit gigantesque, grande terrasse, cuisine, coin salon 2 tv. piscine. (ouverte jusqu'à 19 h avec relax à disposition pour le client).petit-déjeuner très très copieux et là encore le personnel très efficace. Neues Hotel mit sehr guter Lage.Auch Zimmer ohne Meerblick haben schöne Ausssicht.Alle Angestellten sind sehr bemüht alle Wünsche zu erfüllen.Werde bestimmt wieder dort buchen.Zum Strand sind es keine zwei Minuten zu Fuss.Gute Restaurants sind in 5 - 10 Minuten erreichbar.